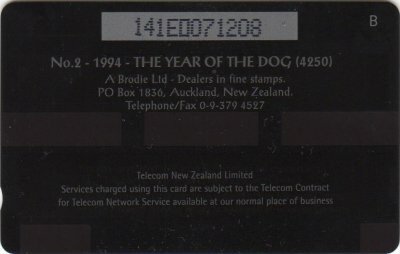 A Brodie produced this Year Of The Dog card, which was the second of an annual release of "Year Of" themed cards. This card was overprinted on unsold stock of the $50 WWF Pigeon card. 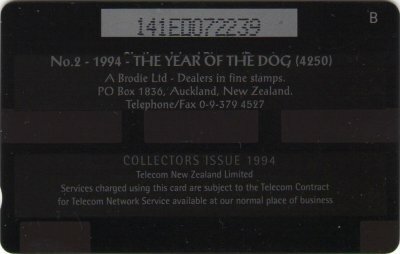 2,850 were available in the Collector Pack NZ-CP-23, and were overprinted Collectors Issue 1994 on the reverse. 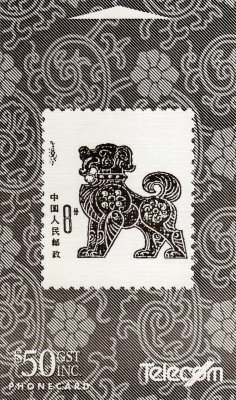 1,400, without the Collector overprint, were available in a numbered Brodie folder, illustrated below.